I got a little obsessed with painting blocks. In fact, I want to paint some more! I like this batch better than my first attempt. I used fewer colors and repeated the same pattern on all sides. I also used 2-inch solid maple wood blocks that I ordered from Etsy (snuggly monkey! ), and they have a satisfying density. I think another type of paint might work better than the acrylic craft paint–maybe oil paint? But, imperfections aside, it was a super enjoyable activity. Even my daughter wanted to make a block. She normally has very little patience for crafts but declared painting blocks surprisingly fun and not as weird as it seemed. Success! « VW Beetle Pillow Progress! 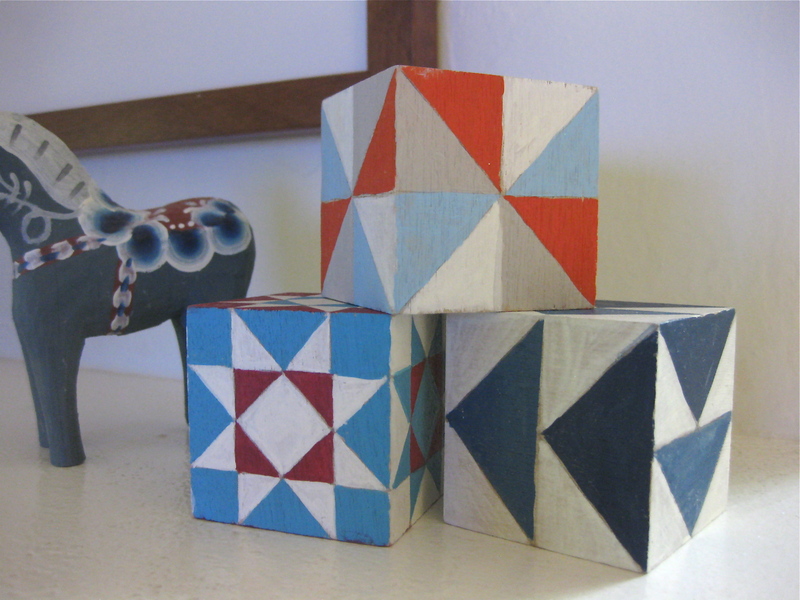 I did some of these kind of painted blocks once, and they were fun. But I really love the pattern you did on these. Could even be a fun baby/kids gift. Thanks, Heather! I think they would be really cute for a kid’s room.